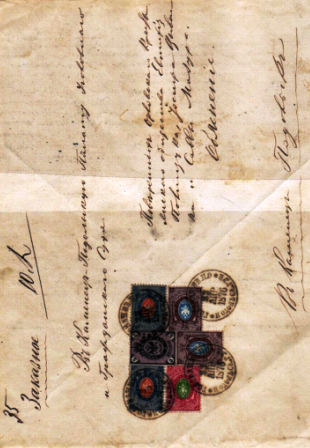 In 1872 the registered letter replaced the insured letter within the Russian empire. Up to 1898 there were no labels or marks used to identify these registered items. On the cover only registration number and weight were noted in writing. Insured and registered mail abroad existed since the first half of the 19th century and was organized by bilateral treaties. Tariffs and handling were unified with the foundation of the GPU / UPU in 1875. To make registered mail distinguishable for the foreign postal administrations an abundance of postmarks was used up to 1898. In 1899 in the whole of Russia registration labels came into use. This was the start of several measures to make registered mail within Russia and abroad more safe and more convenient for the customer. Such economical ways of registration among others have been the use of numerator postmarks, machine registration, self registration in private books, registration in the letter box, or the use of "3" and "R" labels for registration within Russia and abroad. This parallel system for Russia and abroad is most clearly visible in the so called "double registration" when Cyrillic and Latin registration marks or labels have been combined with each other. During the first world war the situation of the postal services deteriorated dramatically. Increasing tariffs reflected the decline of the rouble and the great need of the state for financial resources. In addition, the well organized system for the characterization of registered items collapsed due to the stringency of materials - provisional rubber stamps and handwritten marks determined the picture. This collection gives at the beginning a survey of the registration within Russia and abroad up to 1898. In a third part one can find the diversity of marks and labels which were used since 1899 to characterize registered mail. The situation during the first world war with its increasing tariffs is described in part 4. At the end related items like acknowledgments of receipt, money letters, and cash on delivery are presemed.